So this has been a long road but we are nearly there. It is probably one of the trickiest engines to build because it uses so many parts from so many engines and suppliers. 155 TS Head on Nord block with 75 front cover. 90mm crank, mono sleeve and fuel injection. Do not try this at home. Anyway, nearly there! Best Christmas wishes! ghnl, giulia_veloce, simon johnson and 2 others like this. very nice! are those the Jenvey TBI units? i'm interested to hear how you like them. I would be interested to know the build, and choices (reasons etc.). A few people seem to be moving to the 155 head, is it that much better, how? What sort of HP/KW are you expecting? I have a good 2L TS out of a ‘91 Alfa75. I also have a good 2L out of an Alfetta that was built for my Duetto. I’m thinking of using the crank and rods from that with then pistons from the TS to up the compression and retain the gearbox spigot. Run the original injection until I decide on throttle bodies. I just want to get the thing in the car (GTJunior). I really like those jenvey ITB’s.. are they as good/better than std 40mm ITB? One should show me any real hp advantage on 155 head over 75 head. In PRACTICE on a dyno, not in theory. I had several engines with 155 heads on a dyno, but never discovered any hp advantage over 75 heads. Veep and giulia_veloce like this. If it runs on ITB, why use a manifold with a corner in it? 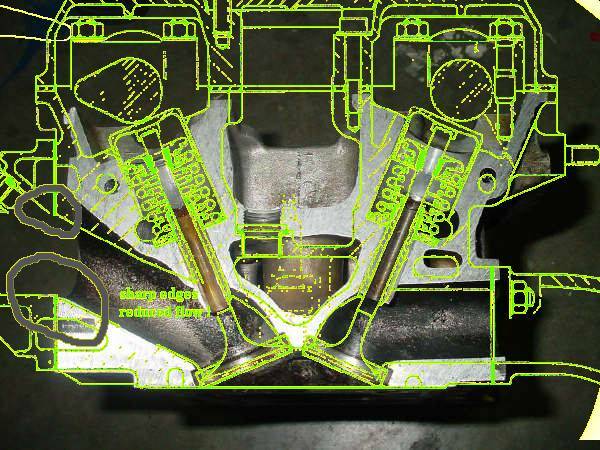 the (said) advantage of the 155 head is the straight inlet tract. Which now is not straight anymore.. In that there is no difference with the 155 head, only the corner is in different place. I agree the 155 has a cleaner more classic look (with the right cam cover...) , even more so when the ribs are removed. If you take a look at 164 with 1962 and 1995 engine (both with catalysts), you can notice the difference in specific torque and the torque curve. Last edited by Max Pershyn; 12-18-2018 at 06:49 AM. any good pics of the 75 vs 155 heads? appearance wise and the intake tract angle? There's a really good thread on the comparison's. The valve angles / and runner angles are basically the same between heads. The main diff is that the 155 has a relief @ the top entry point from the intake for the injectors. There are some other minor differences (dep. on your view). For example, the 75 head will only work with a 75 front cover, whereas the 155 will work with any 105 front cover. Last edited by kpc655; 12-18-2018 at 08:02 AM. The increased engine capacity (very close to the physical limitations) allowed to overcome disadvantages of catalyc converter. Last edited by Max Pershyn; 12-18-2018 at 07:58 AM. So my reasons are as follows. In South Africa 75s were never sold. It almost impossible to find a 75 engine. Happily though we had many 164s and 155s in 8V so naturally this engine is easier to obtain. I wanted to stick to the 105 block and in my opinion this is the best way to make it all work. I already have a NOS 90mm crank in another engine and the Nm is much better with this crank. Using the Monosleeve allows for the safe use of 85mm Spruell pistons and thus a 100cc more than a 1962cc engine. As far as the looks go I believe the 155 head to be better looking than the clumsy 75 one. Personal choice and supply I guess. As far as power goes, what you put in is what you get out. Unless you have back to back tested all the options then power figures and advantages of one over the other is all just useless opinion. I have never seen a dyno graph of an engine like mine so one cannot speculate. I wanted a monosleeve TS injected engine but could not afford a real GTAm engine so this will just have to do for now. Happy to share Dyno figures once installed but my 90mm 105 engine is much better than my identically built 88.5mm engine. Same everything! Obviously one has to use 156mm rods in the 90mm stroke engine. I would be very happy if this engines makes even 1hp more than my Nord 90mm engine. Very happy. simon johnson and Max Pershyn like this.